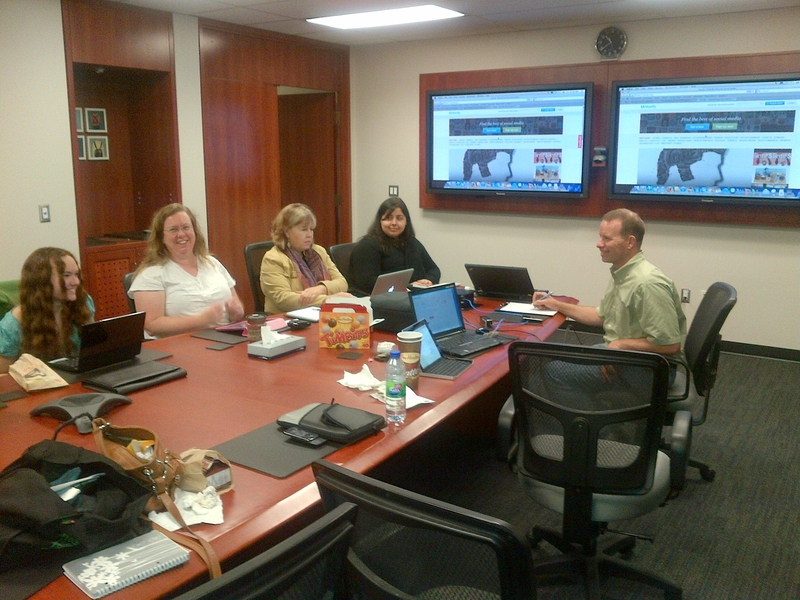 The entire team of York’s Knowledge Mobilization Unit met August 17 for an annual summit. On the agenda was unstructured time to explore new technology followed by working the left side of our brains in arts-based activities (ok, truth is we played!). Toute l’équipe de l’Unité de mobilisation des connaissances de York s’est réunie le 17 août pour un sommet annuel. Au programme, une période non structurée pour explorer de nouvelles technologies suivies d’un atelier visant à faire travailler le côté gauche de notre cerveau par le biais d’activités artistiques (OK, en fait, nous avons joué!). If there is one complement our service unit gets on a consistent basis, it is the strength of our technical presence within the wonderful world of KMb. Our website, twitter, delicious, blogging on wordpress, our use of O3, YouTube, bit.ly, tiki-toki, and recently the use of slideshare have all helped to amplify our work as brokers, and more important, shine a light on the collaborative projects we helped broker and support. On August 17, as part of our annual KMb Summit, the entire team of York’s KMb Unit met offsite for some unstructured time to think, dream and discuss technology. This is an important annual conversation for us and we started with a review of our existing suite of technology. More important, and more exciting, was an examination of new possibilities for us. Platforms like Pinterest, Prezi, Paper.li, Doculectures, Storify, Basecamp and Slideshare were demonstrated, discussed and dissected within the team. Seven new platforms in one morning, not too bad! All were interesting but we reminded ourselves to be wary of the shiny object syndrome. New social media tools will only be introduced if they have an audience and make sense for our business processes. The day then continued as we all headed out to Snakes and Lattes for lunch and some left brain exercise. Snowshoes or Show Shoes, really, the difference is subtle. Safe to say that while our artistic talents pale in comparison to our abilities to mobilize knowledge, we will remain a hard-working and fun-loving group! In closing, special thanks to the summer students of 2012 for their excellent work! Read more about our students and their successful summer very soon!! Thanks, too, to Jane Wedlock, Knowledge Mobilization Officer at United Way York Region for joining us. She’s an important part of the team! Thanks also to Robyn Read of Ben Levin’s Research Supporting Practice in Education group for providing us with the space to play downtown. In her words “I am impressed every time I see your group in action”. 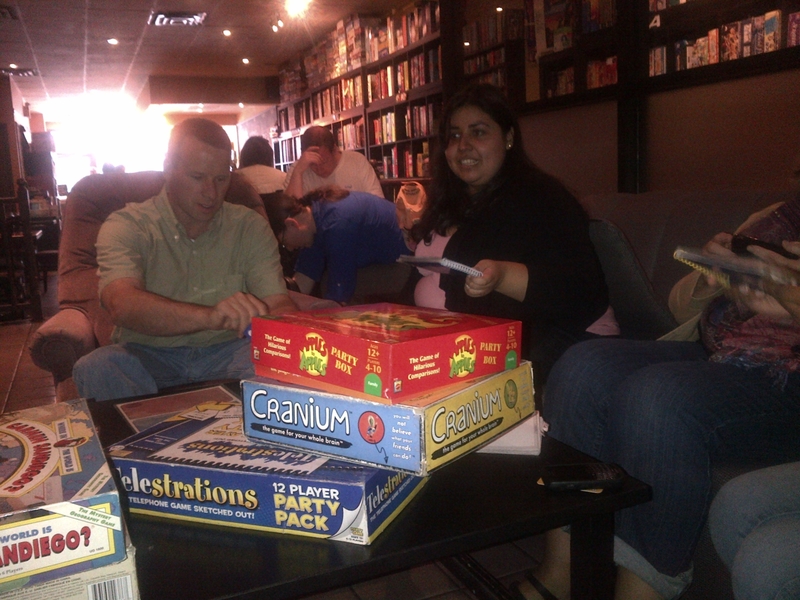 And that drink with the OISE and McMaster groups… count us in!